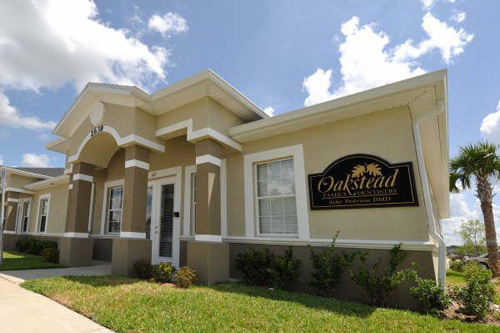 Welcome to Oakstead Family Dentistry in Land O' Lakes, Florida! We’d like to welcome you to our family oriented general dentistry practice in Land O' Lakes, Florida. We’re pleased to provide the families of Land O’ Lakes, Lutz, Odessa, Trinity, and Tampa, Florida with quality, comprehensive dental care. From regular checkups and preventive measures to life changing smile makeovers and restorative procedures, we are committed to delivering personalized, patient-focused care in a high-tech environment. Our friendly, neighborhood office in Land O' Lakes offers a refreshing blend of state-of-the-art dental technology, accommodating financing options, and superb customer service. We want you to achieve the smile you deserve and enjoy the process, too. We know the difference a healthy, beautiful smile can make in your personal and professional life, and we want that for you! Our team will take great care of you and your smile. From the complimentary refreshments, internet cafe, and video games for kids in our reception area, to the HDTVs, headphones, and blankets in our treatment rooms, you’ll find that we’ve designed our practice around your comfort and convenience. Combine our wonderful amenities with Dr. Jake Pedraza’s extensive knowledge, experience, and gentle touch, and you’re in for a more comprehensive and relaxing dental experience than you ever thought possible. So, if you're looking for a warm and welcoming dental practice that puts you and your family first, we invite you to come in and let us treat you to a new level of care. We hope our website proves to be a useful tool to learn more about our practice, team, and services. Please take a look around the site, and then call us with any questions or to schedule a convenient appointment. You can also send us an email on our CONTACT page, or feel free to stop by our office any time to make an appointment. We look forward to seeing you and your family!